Nancy Drew And The Hidden Staircase is now available on Blu-ray™ Combo Pack, DVD and Digital! Did you grow up reading Nancy Drew books? I used to love reading these mystery books, and have many fond memories of my childhood during summer vacation, grabbing a stack of my favorite Nancy Drew books to read in the car during summer travel, or holing myself in my bedroom on a rainy day to read one of the many Nancy Drew books I would take out of the public library and read as part of the school summer reading program. Not only was I a fan of the books, but many of my friends were, too, so we would pass around books in the popular series to each other to read, and then come together to discuss. We even played detective and tried to come up with new plot lines/story ideas for Nancy Drew to uncover. But, none of us ever thought about such a wonderful movie like the "Nancy Drew and the Hidden Staircase" I recently watched with my girls. My oldest daughter is almost nine and is right around the age I started to read Nancy Drew books. So, I thought this would be the perfect introduction to the bestselling book, by sharing the movie with my girls first, and then passing down my collection of Nancy Drew books my mom had saved for me all these years. Summer is right around the corner, and both of my girls love to read, like I do, and love reading for pleasure and to take advantage of the summer reading programs at the nearby libraries. So, I know they would love to have some new books to dive right in and enjoy. I had seen the trailer for this movie and saw that this movie was made to go with the newer generations and not solely based on the books I used to read in the 80's and 90's. But, that was good, as I knew my girls would rather watch a new movie with a hip new vibe, than sit for my oldies but goodies movies. :-) I have to admit, it took me a little while to get into the movie, as I am used to the old Nancy Drew books, and this was not like the old books and characters I used to read about. My girls, on the other hand, were watching the movie intently, and were hooked from the opening scenes. I could see them really getting into the movie and trying to solve the case, just like I used to do when I picked up a Nancy Drew book to read and enjoy. I eventually got into the movie and found myself loving the new take on the classic Nancy Drew series. There were so many twists and turns, and leaving on you on the edge of your seat. I liked this about the Nancy Drew series, and was happy that this was carried over into the new movie release. By the end of the movie, both of my girls were all smiles, as they started to rave about the movie. They definitely want to watch it again, but also want to start reading my Nancy Drew book collection, and help Nancy and her friends solve the different cases. :-) Who knows, maybe we will do a little Nancy Drew book club in our house, and I will have reason to pick up some of my old Nancy Drew books to read again, and talk about with my girls. The iconic mystery solving teenager from the classic Nancy Drew books is back with an all-new feature length film that will keep you guessing until the very end! Warner Bros. Home Entertainment will release Nancy Drew And The Hidden Staircase on Digital starting March 26, 2019 and Blu-ray™ Combo Pack & DVD on April 2, 2019. Executive Produced by Ellen DeGeneres, the film stars Sophia Lillis (IT and “Sharp Objects”), Sam Trammell (“True Blood” and “This is Us”), and Linda Lavin (“The Good Wife” and “Alice”) and follows Nancy Drew in her new town, making new friends and on a mission to solve the case! The film carries a suggested retail price of $19.99 for the Digital, $19.98 for the DVD and $28.98 for the Blu-ray Combo Pack. 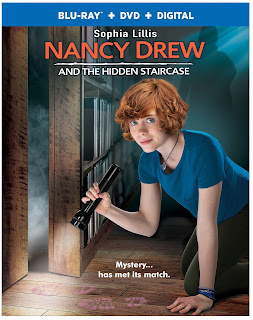 Nancy Drew And The Hidden Staircase is produced by A Very Good Production and A Red 56 Productions. Based on the novel by Carolyn Keene, the film is Executive Produced by Ellen DeGeneres and Wendy Williams (Free Ride), with Jeff Kleeman (The Man From U.N.C.L.E.) and Chip DiggIns (A Walk In The Woods) serving as producers and Rachel Abarbanell (“Splitting Up Together”) as Co-Producer. Katt Shea (Poison Ivy) directed from the script written by Nina Fiore & John Herrera (“The Handmaids Tale”).